In a pan take oil,once hot add elachi,cinnamon,cloves and bay leaves.Once they are fried add onions and green chillies. Saute till onions are pink in colour.Add Ginger garlic paste and fry till the raw smell of ginger garlic paste goes. Then add potatoes.Sprinkly salt.Cover and cook until the potatoes are soft. Then add tomato puree.Mix thoroughly and cook until the oil leaves the sides of pan. Add kheema and green chillies.Mix thoroughly.Cover and cook for 3-4 minutes. 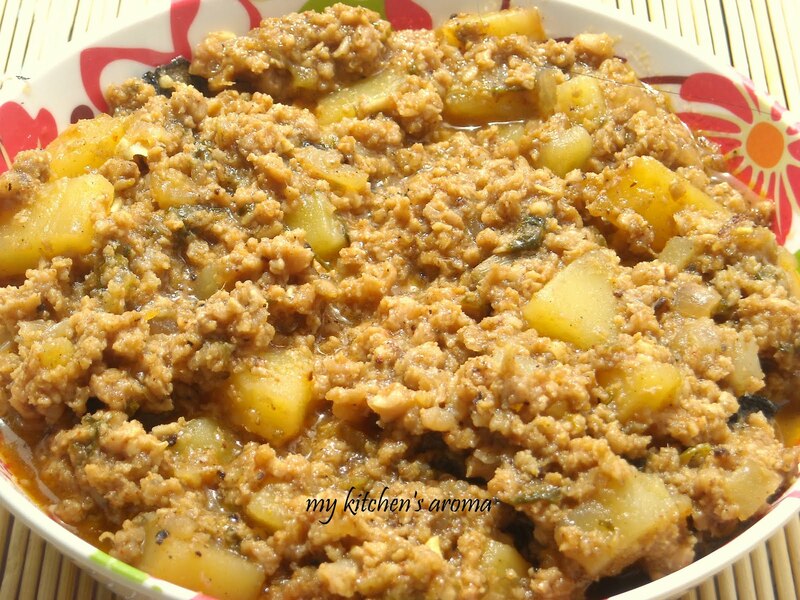 Truly tempting aloo kheema, goes prefect with rotis..
My kids would love that. Hi Sarith How are you hope you all doing well nice combo. looks yummmm. This is a yummy combo! I'd try this with chicken!